As we have visited the site of Chief Albert John Luthuli, some history? Location of death: Groutville, Natal, South Africa. Chief Albert Luthuli, who became Africa’s first Nobel Peace Prize Laureate in 1960, was President-General of the African National Congress (ANC) from December 1952 until his death in 1967. Luthuli was the most widely known and respected African leader of his era. A latecomer to politics, Luthuli was nearly 50 when he assumed the leadership of the ANC. Over the course of his political career his approach became increasingly militant. Yet, there is still no consensus about whether he approved of the ANC’s transition from a peaceful organisation into one committed to armed struggle. Luthuli was born in 1898 near Bulawayo in a Seventh Day Adventist mission. His father died when he was an infant, and when he was 10 years old his mother sent him to the family’s traditional home at Groutville mission station in Natal. Luthuli then lived for a period in the household of his uncle, Martin Luthuli, who was at that time the elected Chief of the Christian Zulus inhabiting Umvoti Mission Reserve around Groutville. On completing a teaching course at Edendale near Pietermaritzburg, Luthuli took up the running of a small primary school in the Natal uplands. Becoming seriously conscious of his religion for the first time, he was confirmed in the Methodist Church and became a lay preacher. The language of the Bible and Christian principles profoundly affected his political style and beliefs for the rest of his life. In 1920 he received a government bursary to attend a higher teachers’ training course at Adams College, and subsequently joined the training college staff, teaching alongside Z.K. Mathews, who was then the head of Adams College High School. At this stage Adams College was reputed to be one of the best schools in southern and central Africa. Luthuli was offered a scholarship to study at the University College of Fort hare but declined it. He opted to stay as a teacher hoping that the £10 monthly salary would help provide for his aging mother. He appears to have had fond memories of Adams College, once commenting that it “was a world of its own”¦ one in which we were too busy with our profession to pay more than passing attention to what happened elsewhere”. Despite their almost privileged and insular lifestyles, some students at the College struggled to make ends meet. Anton Lembede, who was to become founder of the ANC Youth League, is known to have worn shabby clothing. The “Amakholwa”, considered the “middle class” of the time, found life difficult. Teachers’ salaries were low and few other professions were open to black people at the time. Luthuli showed empathy with working people’s concerns, joining the Natal Native Teachers Union, and in 1928 was elected its secretary. He accrued valuable political experience by organising boycotts and acting as a negotiator with white authorities. The American Board Mission’s support of the idea of “muscular Christianity” and the value of a “healthy mind in a healthy body” provided an ideal environment for the meeting of western and indigenous cultures. Football was the school’s most popular sport and as a young faculty member, Luthuli became secretary and supervisor of Adams College Football team, Shooting Stars. By his own admission, Luthuli was not a sport enthusiast, except for an occasional game of tennis. The American Board Mission had established other football teams, including Ocean Swallows of Umbumbulu (established in the 1880s), Natal Cannons of Inanda (1890s), and Bush Bucks of Ifafa (1902). This institutional support and promotion of sport is consistent with, and lies at the heart of, Victorian England’s rational recreation movement. Luthuli’s success in popularising sports as a vehicle for good living can be seen in how the idea spread throughout Natal and the Transvaal. Many former Adams students went on to become players and officials in football leagues and clubs in the two provinces. The Witwatersrand District Native Football Association was founded by the “mabalanes”, or Zulu-speaking clerks. Structured along ethnic lines, these clubs were encouraged by mine management, who saw in them the potential “to keep Natives wholesomely amused”. Membership to the clubs not only occupied their leisure time and emphasised their elite status but also promoted an ethos of loyalty to the mine. Luthuli and the Mabalanes expressed a “profound cultural ambivalence” about their identity, which straddled traditionalist and modern experiences. It was while Luthuli was steeped in this hybrid world of Western values and traces of traditionalist existence that he was called upon to become chief in his ancestral village of Groutville. Initially, he resisted the appeal by village elders to take up the chieftaincy. Succumbing to pressure from the elders of his tribe, Luthuli agreed in 1935 to accept the chieftaincy of Groutville reserve, and returned home to become an administrator of tribal affairs. For 17 years he immersed himself in the local problems of his people, adjudicating and mediating local quarrels, and organising African cane growers to guard their own interests. In the early years of his chieftaincy, Luthuli became immersed in the struggles of the cane growers in his chiefdom. At this stage the South African Cane Growers Association, established in August 1927, dominated the production and marketing of sugar cane. Various other associations were established to represent the interests of African, Coloured and Indian sugar cane growers. It is possible that Luthuli became involved with African cane growers, defending their interests. During this period in South African history, the process of land dispossession was largely piecemeal, with Africans resisting total expropriation by finding creative ways of securing access to land. However, by the middle of the 1940s, many African growers had been marginalised, and the government had turned on Indian growers. The Asiatic Land Tenure and Indian Representation Act, 1946 (Act No. 28 of 1946) was a legislative measure adopted by the government in an attempt to reduce Indian growers to wage labour. The ANC, the Transvaal Indian Congress and the Natal Indian Congress resisted the new measure. 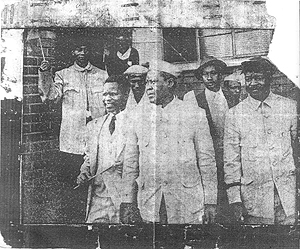 In what became known as the “three doctors Pact” Dr. AB Xuma, President of the ANC, Dr. GM Naicker, President of the Natal Indian Congress, and Dr. YM Dadoo, President of the Transvaal Indian Congress, signed a joint declaration of cooperation on March 9, 1947 in a bid to mobilise support for a campaign aimed at resisting these measures. Through minor clashes with white authority Luthuli had his first direct experience with African political predicaments. Travel outside South Africa also widened his perspective during this period; in 1938 he was a delegate at an international missionary conference in India, and in 1948 he spent nine months on a church-sponsored tour of the United States. At this stage Luthuli was being gradually eased into a political involvement transcending his role as a chief. Sensing that the ANC in Natal was moribund, and aware of the leadership vacuum created by the illness and the death of John L Dube in 1946, Luthuli became actively involved in strengthening the organisation. Beginning his career in national politics, Luthuli defeated Selby Msimang in a by-election for a successor to Dube on the Natives’ Representative Council (NRC). Luthuli was returned unopposed to the semi-defunct council in 1948. With the backing of the Natal ANC Youth League and Jordan Ngubane in Inkundla ya Bantu, he advanced another step onto the national stage in early 1951 by narrowly defeating AWG Champion to become the Natal provincial president of the ANC. His public support for the 1952 Defiance Campaign brought him finally into direct conflict with the South African government, and after refusing to resign from the ANC, he was dismissed from his post as chief in November 1952. During the Defiance Campaign Luthuli was actively involved in soliciting and recruiting volunteers. He was particularly active on the East Rand where, along with Oliver Tambo, he addressed numerous meetings on different occasions. He made numerous trips to the East Rand during the campaign, visiting Katlehong, Tokoza and Tsakane outside Brakpan. The Defiance Campaign in these townships coincided with numerous popular protests such as bus boycotts, squatter movements and industrial strikes. These interactions brought him into contact with leading trade unionists in the region, and helped raise his profile as a potential national leader. In response to his removal as chief of Grouville, Luthuli issued “The Road to Freedom is via the Cross”, perhaps the most famous statement of his principles a belief in non-violence: a conviction that apartheid degrades all who are party to it, and an optimism that whites would sooner or later be compelled to change heart and accept a shared society. The notoriety gained by his dismissal, his eloquence, his unimpeachable character, and his demonstrated loyalty to the ANC all made Luthuli a natural candidate to succeed ANC President James Moroka, who at his trial during the Defiance Campaign tried to dissociate himself from the other defendants. At the annual conference of December 1952, Luthuli was elected ANC president-general by a large majority. Bans, imposed in early 1953 and renewed in the following year, prevented him from giving direction in the day-to-day activities of Congress, but as a country-bred “man of the people” combining the most inspiring qualities of Christian and traditional leadership, he became a powerful symbol for an organisation struggling to rally mass support. He was re-elected president-general in 1955 and in 1958. Although bans confined him to his rural home throughout his presidency, he nevertheless was able to write statements and speeches for presentation at ANC conferences, and occasionally circumstances permitted him to attend conferences personally. In December 1956 he was included in the treason arrests, but was released with 60 others in late 1957 after the pre-trial examination. He was subsequently called as a witness for the defence and was testifying in Pretoria on the day of the Sharpeville shooting in 1960. He enjoyed a period of relative freedom between his release at the end of 1957 and May 1959, when a new ban confined him to the Lower Tugela district for five years. During this lapse in restrictions, he made a number of highly publicised speeches to whites and mixed audiences, climaxed by a tour of the Western Cape. His polished speeches and balanced appeals for reason in race relations earned him the praise of many whites. Reactions were not all sympathetic. At one meeting in Pretoria he was assaulted and knocked off the platform by a group of young Afrikaners. Almost from the beginning of his presidency, Luthuli was confronted by critics warning that he was allowing himself to become a tool of the ANC’s left wing. Due to the circumstances of his restrictions, he was unable to closely supervise the activities and movements of other ANC leaders, but he was realistically aware of the problems and hardly the naÁ¯ve figure that some critics said he was. His reply was always to defend the right of people of all ideological persuasions to play their part in the struggle for African equality and to support the multiracial Congress Alliance as the foundation of a future integrated society. In ideological terms, he personally expressed a preference for socialism of the type espoused by the British Labour Party. Until recently, it was widely assumed that Luthuli launched the armed struggle upon his return to South Africa after receiving the Nobel Peace Prize. It has since become apparent that he was ambivalent in his support for the transition to armed struggle. According to Scott Couper, it is because of his “domestic and international prominence and impeccable moral character that liberation struggle icons, political parties and politicians justify, in part, their past actions and their contemporary relevance upon a contrived historical memory”. Couper argues that Luthuli did not support the initiation of violence in December 1961 because “his political career proved to be “bound by faith. I’v been asking this question ones in Belgium and couldn’t answer it at the moment. How many countries in AFRICA!!!! Among the African countries, the biggest one is Algeria, occupying around 7% of the continent’s territory. And the smallest nation is the Seychelles, the worldwide famous luxurious beach holiday destination, occupying 115 islands stretching along the mainland’s eastern coast. The colourful Morocco is in the first place among the most popular travel spots in this part of the world, the second place belongs to South Africa, followed by Egypt and Tunisia.